When do I Start a New Paragraph? Narrative Leads That Hook You! Let's look at them one at a time. This one's mainly for essays. Every time you go on to a new topic, you should make a new paragraph. Life in Dullsville remained unchanged. The seconds seemed like hours. Scenes in stories generally happen in one place. When the characters go to a new place, a new scene happens. At the very least, a new paragraph happens. Any time you have a "Meanwhile, back at..." phrase in your story, make a new paragraph. 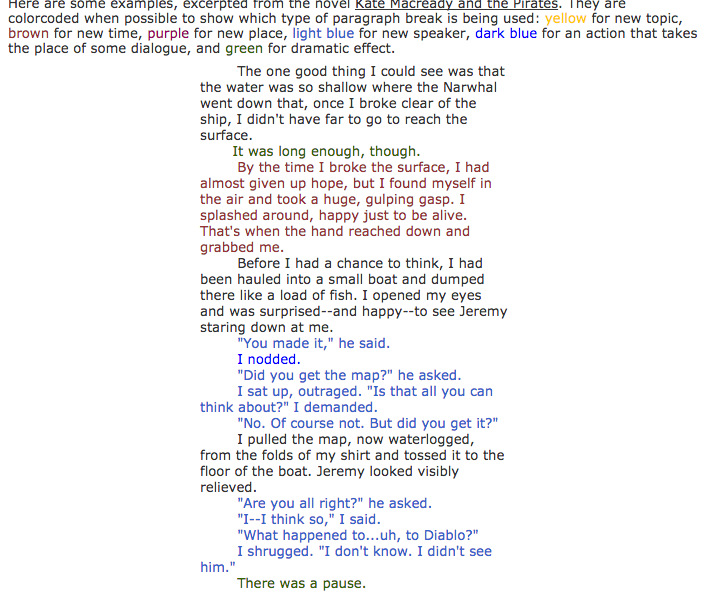 If you're doing a good job, your short stories are going to have dialogue, or characters talking to each other. Dialogue helps bring stories to life. Every time you switch speakers, you make a new paragraph. Sometimes this means that your paragraphs are really short, because all a character might say is, "Nope." If that's all he says, though, that is as long as the paragraph needs to be. Another thing to remember is that, if you put the "he said" phrase before the quote, or you character does some action before he speaks, you should make that part of the same paragraph as the quote. A good writer will break long stretches of dialogue up with snatches of action. This is good for the rhythm of the piece. Changing things up makes the conversation flow smoothly, at least from the reader's standpoint. It also helps make a picture in the reader's mind by inserting just the right detail to bring the scene to life. The last reason for using this kind of paragraph break is that people don't always reply with words. Sometimes they shrug or make a face or ignore the other speaker entirely. Sometimes you simply want a paragraph to stand out, or you want to slow the reader down and control the pace of the story. At times like this, you can make a brief sentence--or even a word--an entire paragraph. Just don't overdo it; this gets old fast. Return to the Online Writing Guide Index.